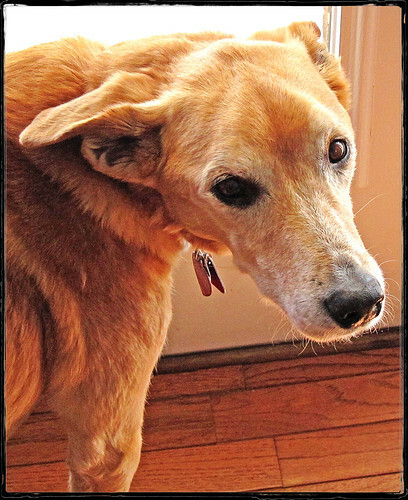 Much as we might wish it were otherwise, our beloved aging dog — who was only a pup just the other day, it seems — is going to hit her golden years sooner than we expect. Although we tend not to think of dogs as old until the signs become extremely obvious, we should be aware that, depending on the breed, your dog may be considered a senior citizen of the canine world from about the age of 7 and on. Smaller dogs tend to be longer lived and may not reach seniorhood until after the age of 10. Still, there is going to come a time when such items as orthopedic dog beds and even doggy diapers may be added to our shopping list. The aging process for people and dogs is not really all that different. The issue is that we humans might not be as skillful at spotting the signs in other species. Dogs tend to get grayer and slower as they age. Hearing and vision might be significantly reduced. Arthritis is extremely common in aging dogs. Dogs are also not immune to dementia and may eventually exhibit much of the same confusion, incontinence, inappropriate behavior, and the rest of the symptoms that you may see in your own parents if they develop Alzheimer’s or another form of cognitive impairment. Again, dogs and people are not so different and what you do for your dogs as they age is not so different from what you should do for your parent as they age — though the dogs are likely to be a lot more cooperative. That’s especially true when it comes to exercise. Unlike a lot of older people, most dogs love nothing more than to go outside and run around with us. While they will inevitably get less active as they age, encouraging most dogs to get more exercise is demonstrably easier than encouraging most of us sedentary humans to do so. Also, watch your dog’s caloric intake. A fat dog isn’t better off than a fat person in regards to all kinds of health risks. As far as dieting is concerned, however, your dog has it easier than you because she can’t open the refrigerator. Your dog isn’t getting any food that you aren’t giving her. There are also both drugs and supplements that can reduce and may even help prevent the onset of arthritis, including products containing glucosamine. Of course, you want to consult with your veterinarian about all the options that are available to help your aging dog feel as good as possible in regards to joint health, including orthopedic dog beds.